Ultima IV, Quest of the Avatar, quite possibly one of the greatest RPGs of all time. The granddaddy of the modern RPG. Big surprise this is probably my favorite Ultima game, with 7 and 5 being close behind. This is my fifth post in my series of how to play all 14 Ultima games on a modern PC. This one is going to be slightly different in that DOSBox is NOT involved. For previous posts in the series see: Ultima III, Ultima II, Ultima I and Akalabeth. Lets get started. As always maps and manuals are of the utmost importance. 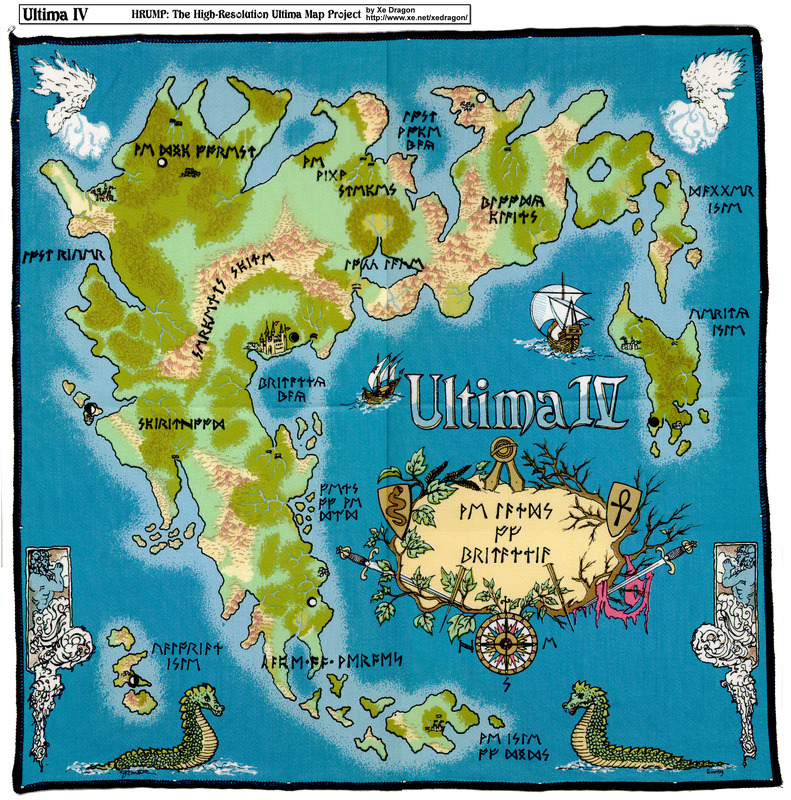 Once again, we whisk ourselves over to the High-Resolution Ultima Map Project and here is the link for the Ultima IV map. Next is the manuals. Ultima IV has two manuals: The History of Britannia and The Book of Mystic Wisdom. Both can be found at replacementdocs.com here and here. Next is the Player Reference Card. I honestly have no idea where I got this scan, but here is a scan of the original MS-DOS Player Reference Card. Going to be honest this one is slightly harder than copying the game files to a directory, but stay with me. Download and install xu4 from here. Do not fire it up yet, we still have some work to do. First we will need the Ultima IV game files. At one point in time these were free to download from all over the place, however I couldn’t find any active links left. Once you have the files replace HYTHLOTH.DNG with the one in this zip file. This fixes a bug that makes level 6 of Hythloth impassable. Next we need to zip them up. Open the directory, in File Explorer, where the files are located and select all the files (Control-A). Now right click the files and go to “Send to” -> “Compressed (zipped) folder” as shown below. Once created name the zip file ultima4.zip (WARNING: if you do not have extensions shown then should just be ultima4, not ultima4.zip). Copy ultima4.zip to the xu4 installation directory, which is most likely “C:\Program Files\xu4″ or C:\Program Files (x86)\xu4”. Next, download the Ultima IV Upgrade from here and save it, still compressed, to the xu4 installation directory. This one is as simple as it gets. Run xu4 from your start menu. Now configuration is where it can get complicated. The default configuration is good, in my opinion. However if you want to explore the configuration, there is lots of options, simply hit ‘C’ at the main menu. I could do a completely separate post on just all the configuration options, so I am not going to go into detail here. Play around if you want to, but the defaults are good. Just run xu4 from the start menu to play!